or Sharon Bowen ’82, some of the most “critically important” experiences of her Kellogg years came while collaborating with her study group. Bowen has parlayed that collaborative leadership style as part of another group — the federal agency charged with regulating futures and derivatives markets. 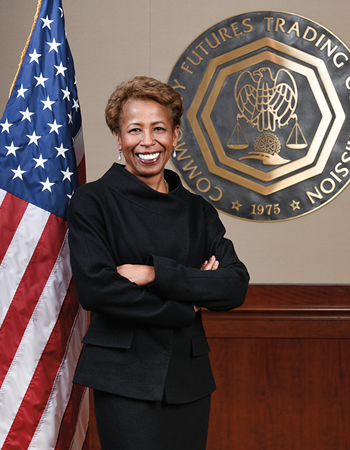 In June 2014, she was sworn in as a commissioner of the U.S. Commodity Futures Trading Commission, becoming the first African-American to serve there. She has kept busy since joining the five-commissioner agency. The group was in the headlines last December when Republicans in Congress agreed to increase its budget in exchange for repealing a controversial derivatives rule in the landmark Dodd-Frank financial industry regulation law. For Bowen, who also holds a law degree from Northwestern, the CFTC job is the latest addition to a lengthy résumé. The former securities lawyer spent more than three decades on Wall Street, becoming a partner in 1991 in the New York office of Latham & Watkins LLP. In 2010, President Barack Obama appointed her vice chair of the Securities Investor Protection Corporation. She took over as acting chair two years later. "I find the work to be fascinating and interesting, and I think that kind of shows." Her work in that post stirred controversy. Sen. David Vitter (R-La.) tried to hold up her nomination, contending that she failed to protect victims of financier Allen Stanford’s massive Ponzi scheme because the SIPC maintained the investors’ legal protections. The Senate confirmed her on a narrow 48-46 vote. Bowen has grown used to being one of the higher profile African-Americans in the financial world, though she said it has never been an issue in her day-to-day activities.